Hello! I hope you all had a wonderful long weekend! We had lots of fun family time~and yesterday we went to the beach : ) I made this quick Christmas tag on Sunday for the Featured Stamper Challenge on SCS, but didn't get a chance to post it here. This week's FS is Lori McAree, a.k.a. LMcAree. She has a fabulous gallery and I chose to CASE this beautiful Christmas tag. I used markers to color my image, and put some Chocolate Kaiser pearls in the center of the poinsettia. The sentiment is from Verve's Just for You set. Well, I'm off to an eye appointment so thank you for stopping by! LOVE this Kerri!!! Just a simply stunning design!!! This is purrrrrrrrrrrrdee!! When I am done with my Christmas cards, I want to do some tags for this year too. Love the brown in there with the red and green too! Hey Kerri!! 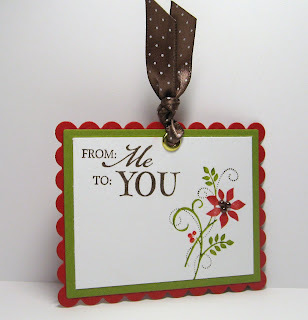 Your Christmas tag is beautiful!!! Lovin your design girl! What a lovely tag Kerri....I really need to make some, and have them ready to go! Beautiful Christmas tag! Wonderful idea for Holidays!